Completed on Monday August 13, 2018 I decided to include a few more friends here. This one evolved each day. I wasn't able to get a squared shot so you see a little of the wall there on the right. Anyway, It's 14x18 painted with oils on a cradled wood panel with painted sides. 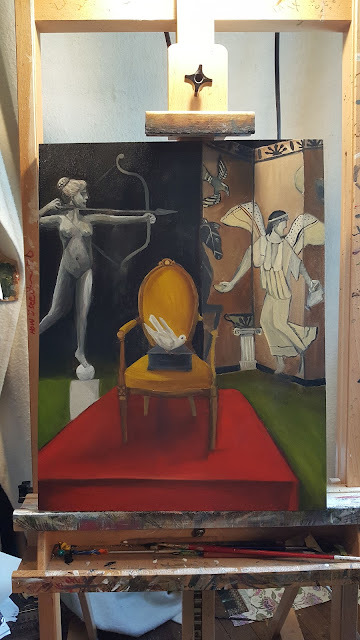 One of the things I am enjoying about oil painting is that you can work on several pieces at once. I'm working on a custom piece but at the same time I am completing this 14x18 painting as well. I like pacing myself and going from one to another. When I work in acrylics, I tend to complete one painting at a time since they dry so quickly. This painting is a collage of sorts bringing together images I am inspired by.